GrowOp Farms' growing facility is a bit like a hospital. A really chill hospital. The inside of the top marijuana producer in Washington state feels a little like a hospital. But like, a chill hospital. Bearded dudes shuffle around the cavernous facility in scrubs and beard nets. Some are trimming the smokable flower while ladies with tattooed arms paint pre-rolled joints with a thick greenish brown liquid, pure THC, and then sprinkle kief on top — basically supercharged joints called firecrackers. Some walls are painted with graffiti, others are decorated with trippy tapestries: a chimp smoking a joint and a tie-dye peace sign, for example. Michael Jackson and Bruno Mars play in the background and a dank aroma hovers over all of it. 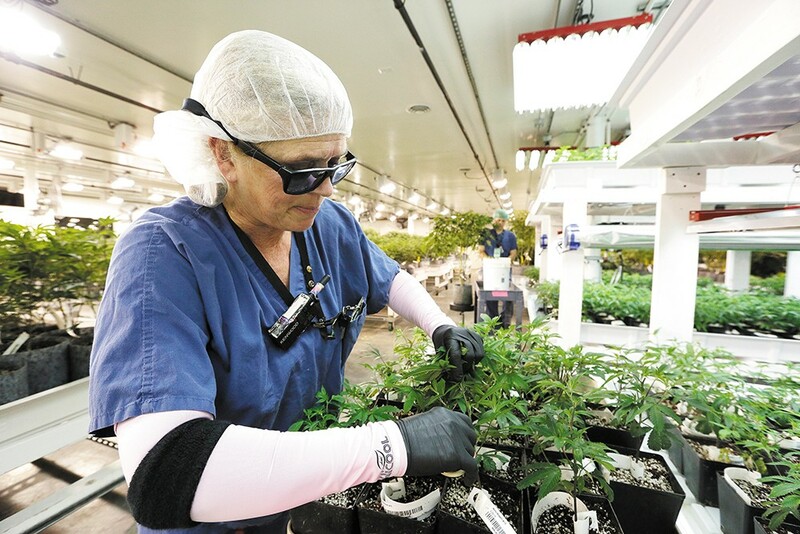 The massive 85,000-square-foot facility in Spokane Valley houses all of GrowOp Farms' production, which sells its flower weed under the brand Phat Panda. Teams of employees are experimenting with different extraction methods while others are testing breeding and genetics different strains. "We look for really outstanding plants, something fruity or gassy," says Mohave Morelli, head of agriculture. "We want it to be unique. There's a lot of good weed out there, but you don't find a lot of great weed." There are about 75 to 80 different genetic variations growing at any one time, Morelli says. But including experiments with cross breeding, add another 200. Standing outside one of the flowering rooms, where plants grow in 12 hours of light and 12 hours of darkness, Mohave says the operation doesn't depend very heavily on cutting edge technology or innovative techniques (though there are some proprietary processes in the extraction lab and candy shop that he can't get into). It's more about the process. "I mean we use top-of-the-line lighting, but we're really not doing anything differently than a lot of growers," he says. "There's no secret. Less is more. We used to feed a lot and push the plants a lot harder from a dietary standpoint. Now we feed a lot less." If there is one high-tech piece of the process, though, it's the environmental controls. The whole system for regulating heating, cooling, air flow, humidity and watering was customized for Phat Panda. "I can be on the beach in Hawaii and go in and look in all my rooms, tell my rooms when I want to water, I can shut off lights, change the temperature and shut an entire room down," Morelli says. "Our digital controls of the rooms are pretty amazing." It takes about five months, from the time a plant has begun to take root until it's ready to go to market. That translates to about a ton of usable flower per month, Morelli says. "Phat Panda in one week sells more cannabis than the entire state of Alaska," he adds. "Typically we have available 350 to 450 pounds of usable flower in a week." Each week, Phat Panda pumps out 100,000 joints, says Katrina McKinley, who co-owns the operation with her husband Robert. Last month, she says, the company sold about $3 million in product. The original print version of this article was headlined "A Ton of Weed"